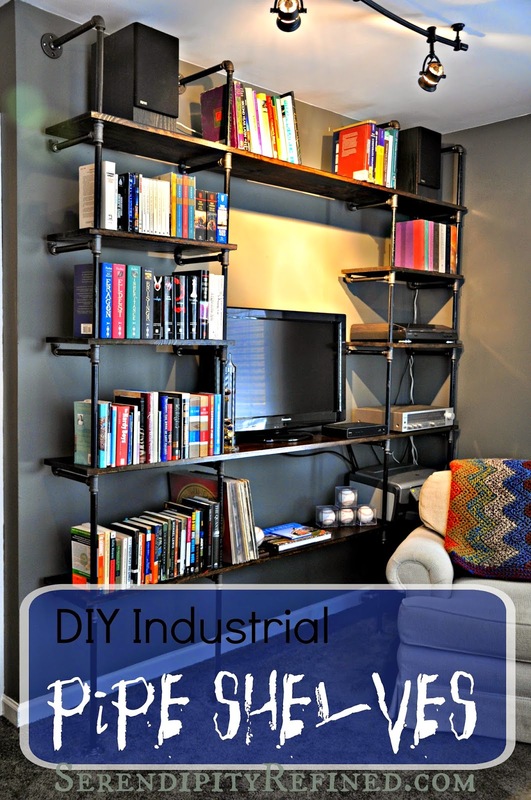 Last weekend, we finished the last of the projects at my son's apartment, we built industrial pipe shelves for his living room wall. 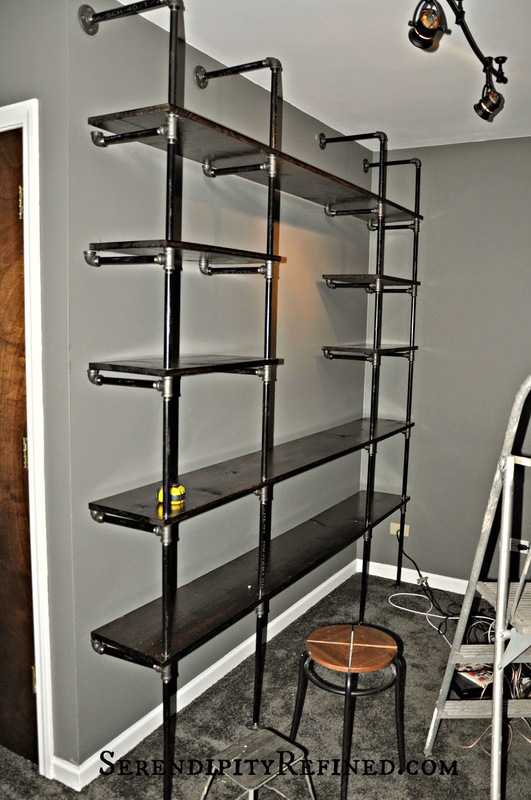 The shelving was made of 1/2 inch black gas pipe and fittings with 1x10 pine shelves which were stained dark using General Finishes Java Gel Stain and Gel Top Coat to match the doors in the apartment. 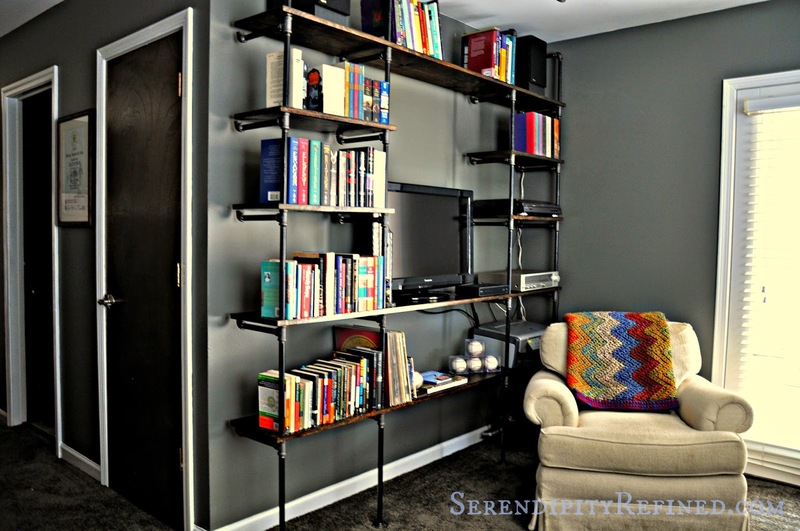 To say that this was a labor of love would probably be an understatement. If you don't believe me, you should probably ask the really nice guys named Joe and Ron who work in the plumbing department at the Home Depot in Machesney Park or Steve, the guy who works in the plumbing department of the Home Depot in Downers Grove. Joe, Ron, and I became friends a couple of Saturday mornings ago when I showed up at 6:30 in the morning with my diagram of the shelves and we spent the next four hours cutting, threading, and filing almost fifty feet of black pipe the longest pieces of which were four that were 18" each. 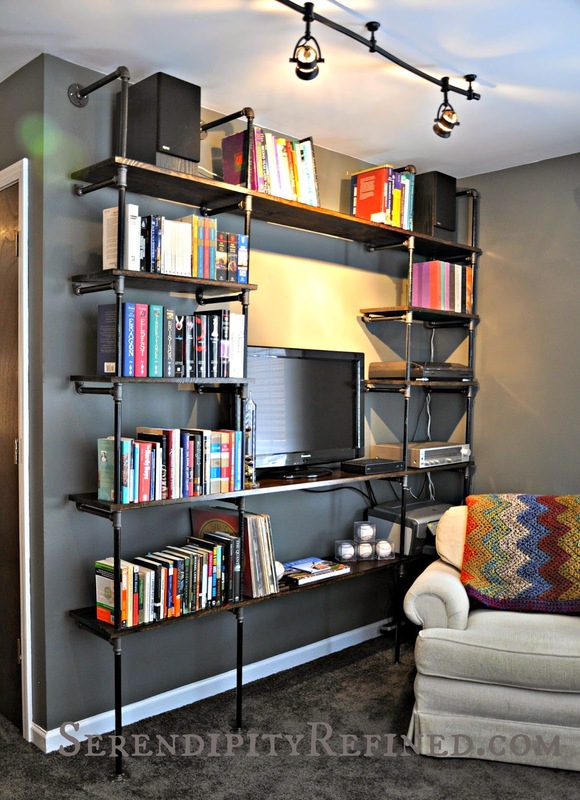 I've included the cut list and materials specifications for this set of shelves. 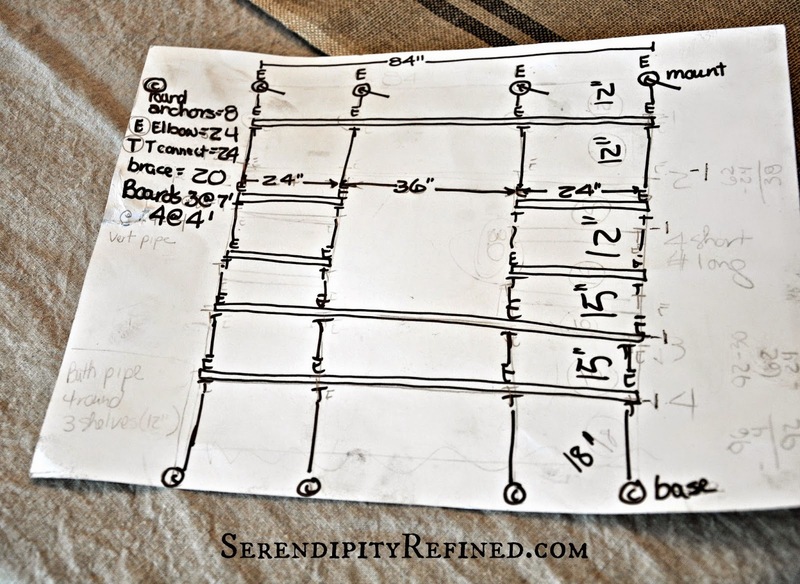 There are lots of instructions out there but if you actually decide to build some for yourself, use what I've learned below as a guideline from which to figure out what you'll need as no two sets are going to be exactly the same. Degree of difficulty: Easy to Moderate. This is not a one person build. It is much easier with two people. 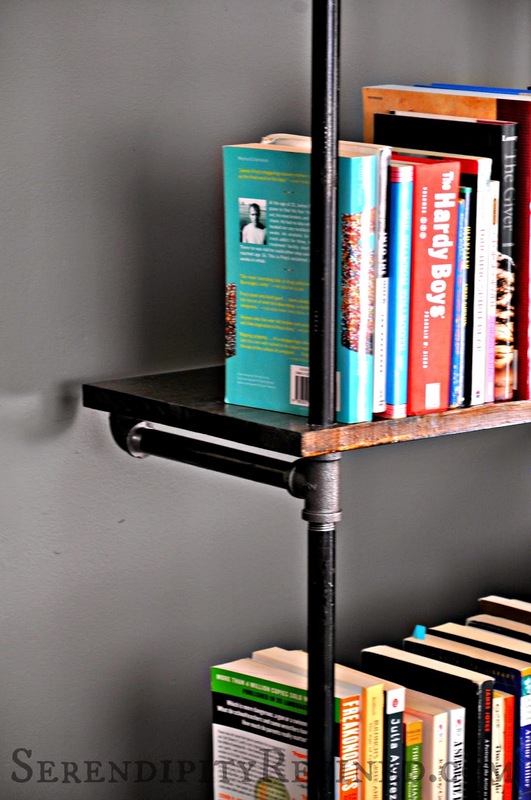 Things to know when planning: 1) The pipes do not screw all the way into the fittings. For every "T", add 1" to the measurement. 8-1/2 inches: (20) Note: we cut ours to 9 inches and they are about 1/2 inch too long. Directions: Pipes are dirty and oily after being cut. Take care not to get the oil on anything. Hands and clothing will get dirty during this build. Wear old clothes and rubber gloves if necessary. 1) Cut and thread the pipe. I did mine with the help of the great staff at Home Depot. They didn't charge for the cuts since I purchased my materials through them. Go early, be prepared to wait. The machine takes awhile to do each cut. 2) File any rough spots on the pipe. You may paint the pipe if desired. We chose to leave it rustic. 3) Wipe the pipes with mineral spirits to remove the oil that they will have on them from being cut. 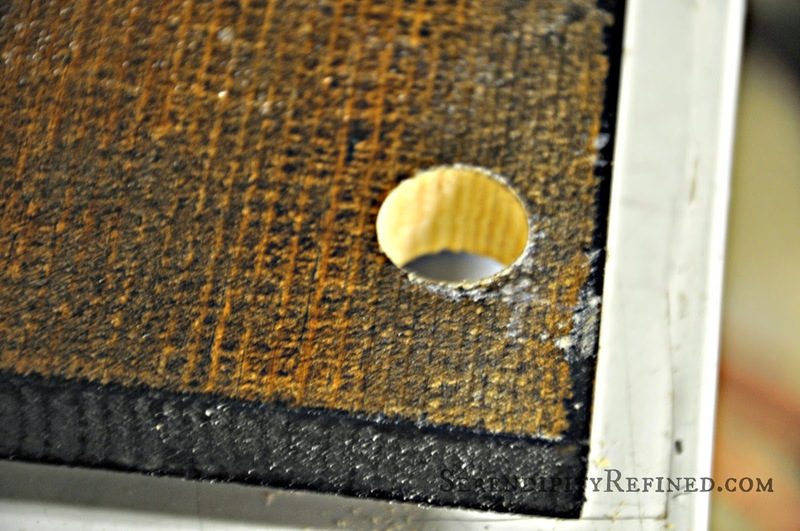 4) Finish wood as desired and drill holes for pipe using 7/8" spade bit and measuring 1" from the end of the board and 1/2" from the front of the board. Drill the two foot pieces first and use them as a template to drill the seven foot boards. 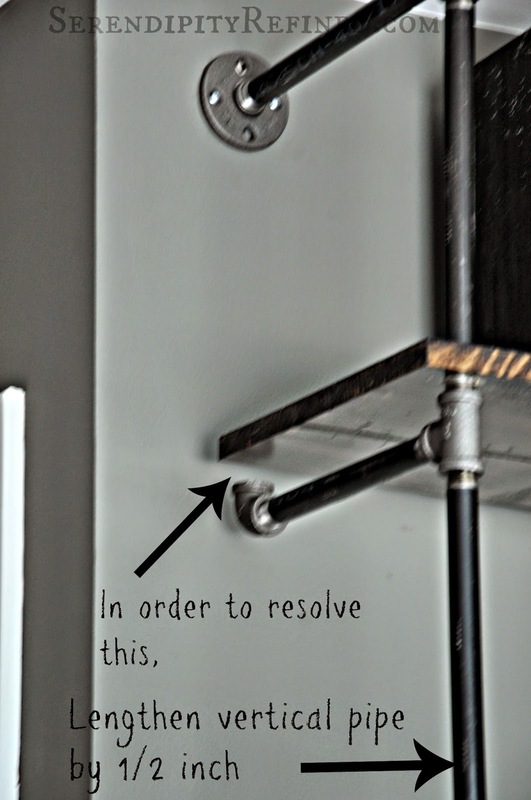 a) Screw one eighteen inch pipe into one round mounting plate (four times). 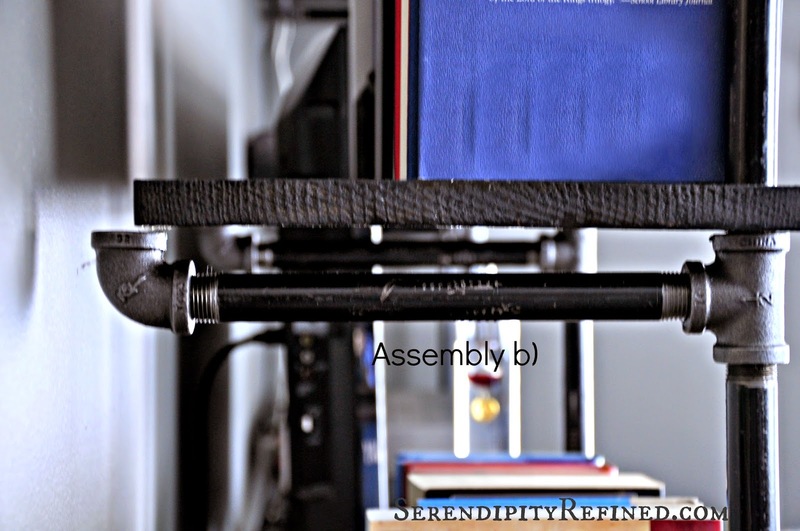 c) Screw assembly b) onto the free end of assembly a). d) Place a seven foot board on top of the four pipe assemblies. h) Place a seven foot board on top of the four pieces. q) To form the top assembly, screw an elbow onto the top of the 12 inch pipe from step p (four times), screw a mounting plate to the end of the assembly (four times). 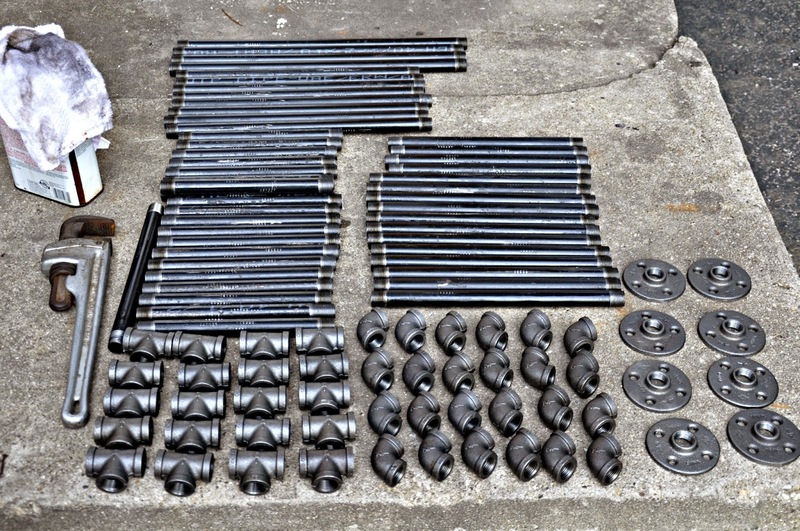 r) set assembly against the wall, check for square and level and fasten to the wall using appropriate fasteners. Other notes: One person should do all of the tightening of the pipes. This helps with consistency so that some of the pipes don't end up shorter than the others due to over tightening. I realize that this is a lot of information and sometimes, my instructions may be confusing and I'm more than willing to answer questions if you'll simply send me an email at serendipityrefined@GMail.com. 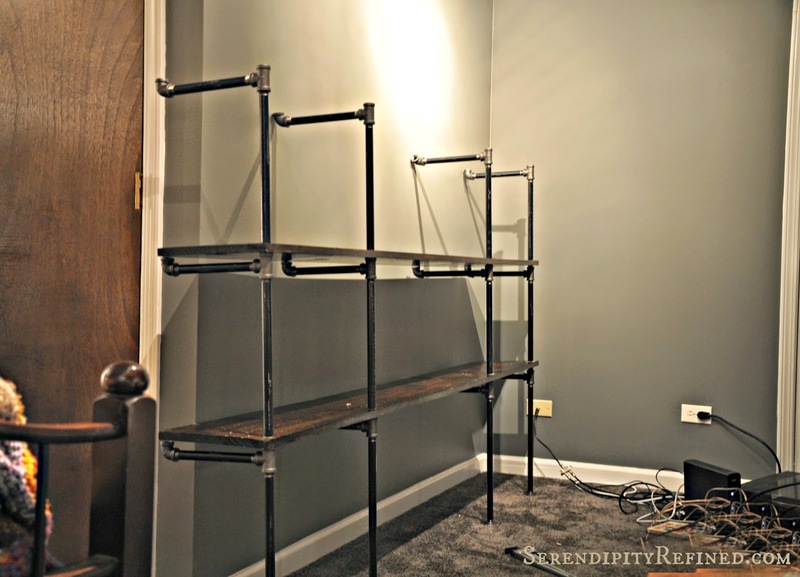 My son and I are really happy with how his pipe shelves turned out. 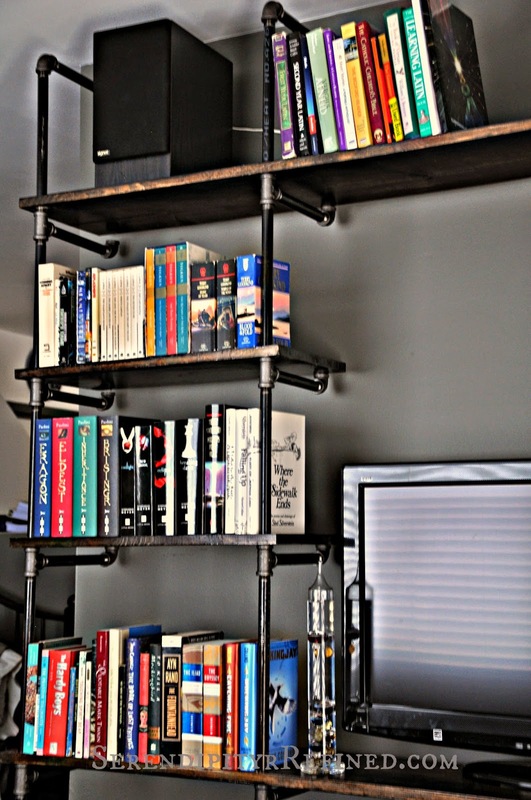 They're an eclectic mix of rustic and contemporary with just enough industrial thrown in to make things interesting. We're still finessing them a little bit and are going to attach the wires to the pipes with some black tape and zip ties so that they're less obvious. 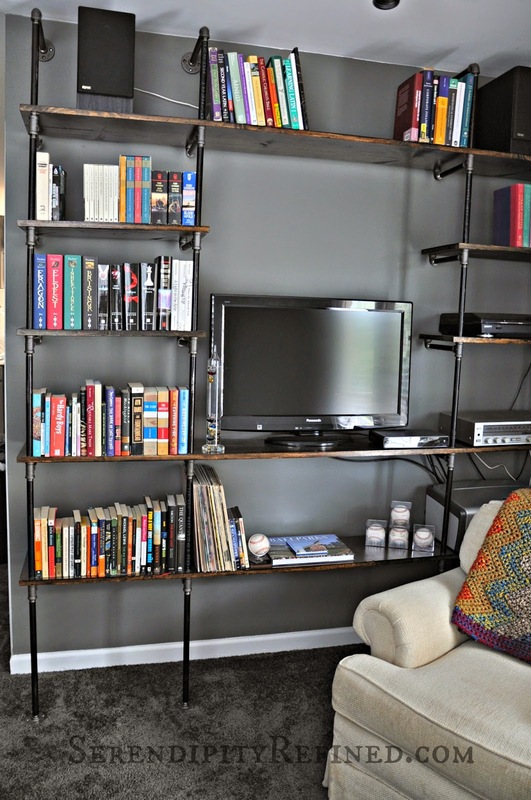 Although the television is currently sitting on the shelf, it will be wall mounted since that was the original plan and since the shelves are already full and I don't really want to make another trip to Home Depot to cut pipe and add a shelf. After all, even a labor of love has limits!